Orry-Kelly, who designed the costumes for Bette Davis in forty-two movies (see Part 1,) was also credited with these designs for Kay Francis in The Keyhole. Butterick chose two designs from the movie to copy as Butterick Starred Patterns 5102 and 5113. 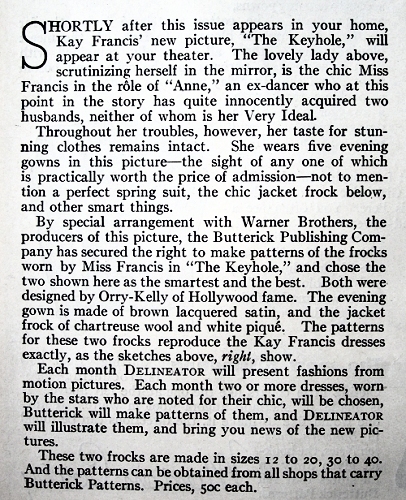 This article introduced the Starred Patterns idea in April of 1933, in Butterick’s Delineator magazine, although the term “Starred Patterns” was not used. Delineator, page 74, from April 1933. This is the first mention of Butterick’s exact copies of clothes from the movies. Patterns 5102 and 5113 were featured. Although she’s not remembered as well as Bette Davis, who displaced her at Warner Bros., Kay Francis was a very big star in the early thirties. “Despite a slight lisp, she was one of Hollywood’s most glamorous and highly paid stars in the 30s, … typically portraying stylish, worldly brunettes in romantic melodramas and occasional comedies…. By the early 40s she had been mostly relegated to B pictures.” — Ephraim Katz, in The Film Encyclopedia. “Each month Delineator will present fashions from motion pictures. Each month two or more dresses, worn by the stars who are noted for their chic, will be chosen. Butterick will make patterns of them, and Delineator will illustrate them, and bring you news of the new motion pictures.” In previous decades, Butterick bragged about its copies of Paris fashions. 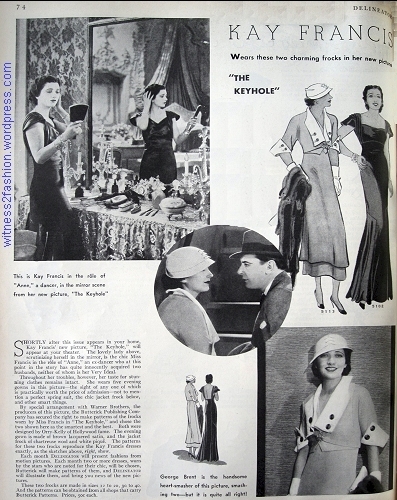 In 1933, there were more references to New York styles, and to the influence of the movies. 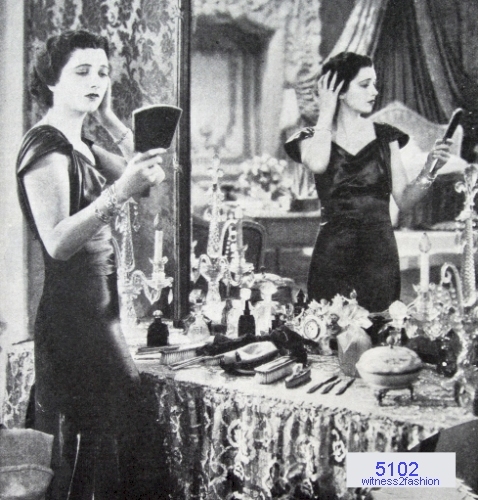 Butterick 5102 was an exact copy of this brown evening gown worn by Kay Francis in the movie The Keyhole. Delineator, April, 1933. 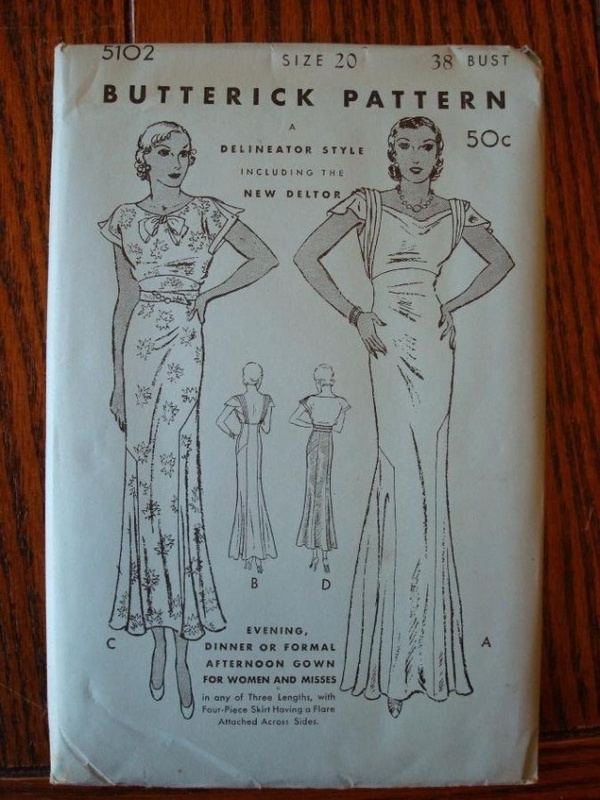 Butterick Starred Patterns 5113 and 5102. Delineator, April 1933. Butterick 5113 and 5102, details. Delineator, April 1933. The dress on the left was lime green and white. The photos from the film show how precisely Butterick’s patterns copied these dresses. 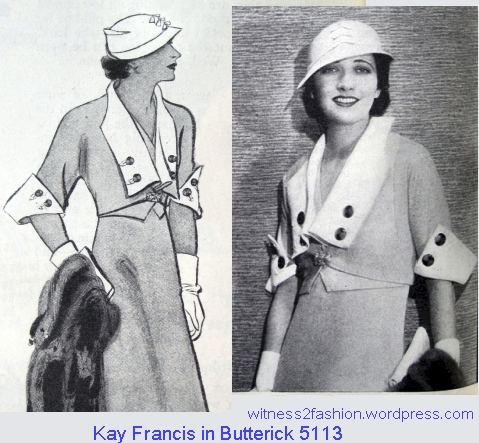 Butterick 5113 was a close copy of Orry-Kelly’s design for Kay Francis. 1933. 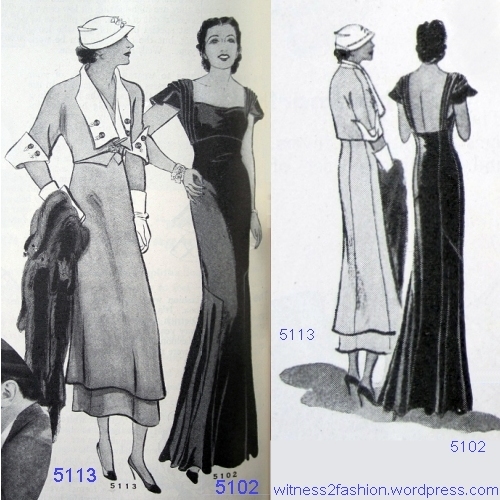 You can see larger images of Butterick 5113 and 5102 at the Vintage Pattern Wikia, where their images from the Fall 1933 Butterick pattern catalog can be found. You can see the pattern envelope for 5102, with a very different bodice, by clicking here. It says nothing about “Starred” patterns, so perhaps that title wasn’t conferred until later. 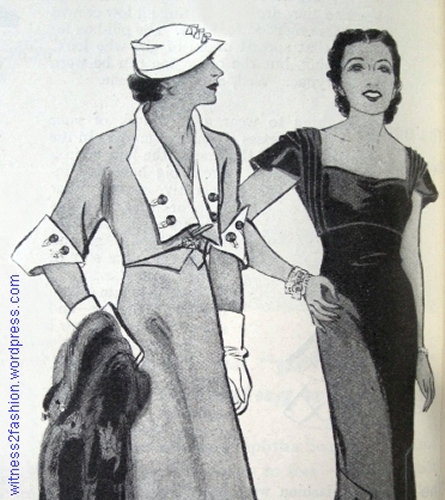 These are actually the first two patterns in the series of twelve, and do appear as a group in the 1933 pattern catalog. After watching a lot of clips on YouTube, I discovered that Kay Francis is much more attractive in motion than she appears in studio portraits. Those downward-slanting eyebrows make her look morose in still photos, but in movies her face seems lively, and her fleeting expressions strike me as more natural and genuine than run-of-the-mill thirties’ acting. She was equally at home in comedy and melodrama. Leonard Maltin’s Classic Film Guide describes The Keyhole as a “seedy romantic drama with Francis anguishing in a variety of elegant Orry-Kelly gowns.” Well, isn’t suffering supposed to make you beautiful? In the movies, it could. I am really enjoying this series. I wonder why only 12 of these patterns were produced. Good question. Perhaps because it was so easy to copy designs without having a contract with the studio? Come to think of it, once the movie was released, a sketch artist would have plenty of chances to see the costumes and not need access to a muslin to make a close copy. Thanks for more great info! I’ve seen a number of Kay Francis movies, and imo, far and away the best is “Trouble in Paradise,” directed by Ernst Lubitsch. It’s available on a Criterion Collection DVD. I bet you’ll love it! It’s hard to go wrong with Lubitsch movies. (And you often get to see some pretty lingerie!) I need to watch Trouble in Paradise again, because I saw some clips while writing the post but didn’t have time to see it all the way through this week. It’s amazing what shows up on YouTube. Whole movies that I used to only see at film festivals…. I see that TCM is showing one of my favorite Pre-Code movies on March 3: Baby Face, which I’d summarize as “Sexually exploited young woman sleeps her way to the top — literally — by exploiting a series of men.” (In 2006, Warner Video released a version of Baby Face on DVD in their “Forbidden Hollywood Collection, Volume 1” which included scenes that were deleted in 1933 to please the censors.) It looks like TCM will be showing the censored version — what a shame! Funny that TCM wouldn’t show the longer version, since they were the ones who made it available. I still think the ending feels tacked-on, though–even just one more scene showing a connection between Stanwyck and Brent would have made it more plausible, I think.